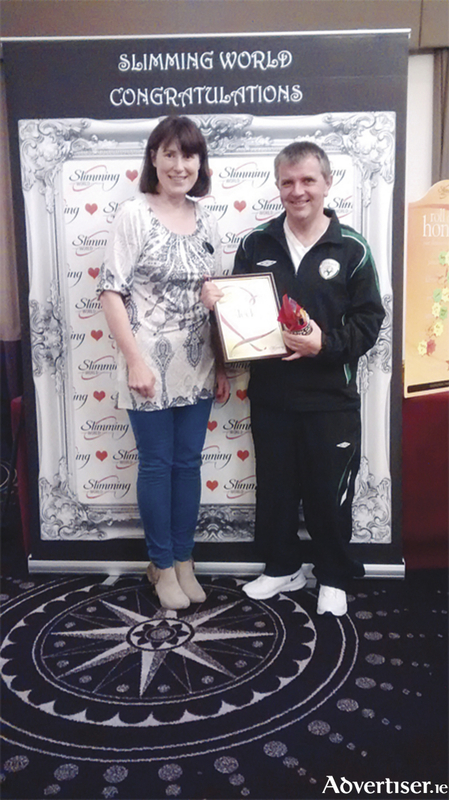 Local man Fergus Rowan has officially been named as The Shamrock Lodge Slimming World Group’s Mr Sleek after losing 4 stone 3 lbs with Slimming World. The Mr Sleek competition recognises male slimmers who have undergone a transformation since joining Slimming World and rediscovered their lust for life, as well as looking great in a sharp suit. Before joining Slimming World in November 2014, Fergus had been diagnosed as borderline diabetic. He also had high cholesterol, and had a lot of back pain as the extra weight caused huge problems to his existing scholiosis condition (curvature of the spine ). Fergus says “I was also very unfit - I’d have struggled to walk 300 yards - and I was constantly tired. Sinead, who runs the groups in the Shamrock Lodge and Garrycastle GAA Club each week, hopes Fergus will inspire other men in the Athlone area who want to lose weight: “Men might think that coming to a slimming club is a bit ‘girly’. I hope Fergus will show that lots of different people come along to our groups and each and every one gets a warm and friendly welcome. It doesn’t matter if you’re a man or a woman, young or old, because ultimately we’re all there for the same reason – to lose weight and to feel healthier and more confident and to be able to do more with our families and friends. Everyone’s welcome at the Sinead’s Slimming World groups at The Shamrock Lodge Hotel every Tuesday at 5.30pm and 7.30pm and in Garrycastle GAA Club every Saturday morning at 10am. Simply come along on the day or for more information call Sinead on (087 ) 6820759.